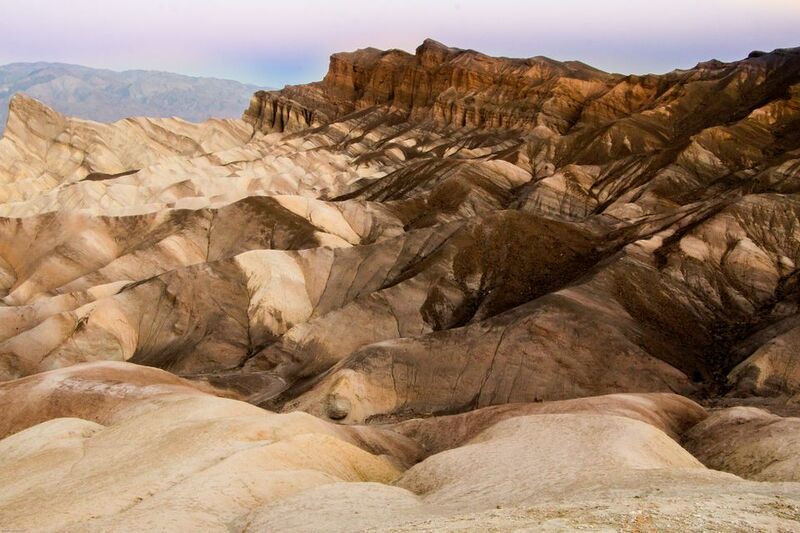 Death Valley is the largest national park in the contiguous United States, covering 3.4 million acres of desert. With scant rainfall and conditions that could evaporate one hundred times what it gets, the Death Valley landscape exposes underlying geology that vegetation might cover in other locations. The result is a stark and varied landscape, with colors and textures thrown next to each other: Rounded, fuzzy-textured hills next to sharp-edged peaks with multi-colored layers below. The first Death Valley visitors arrived in 1849. Those ill-prepared gold-seekers trying to find a shortcut to the gold mines further north nearly died, giving the valley its name. People who go to Death Valley like its far-away-from-it-all feeling and photographers especially enjoy its natural beauty. A few even go just to experience the heat. If you don't like deserts and desert landscapes, you may not like Death Valley. One unhappy visitor commented "... nothing but rock and salt." Another said "no wildlife, scanty vegetation, and scorching desert sun." You need some time to see Death Valley and appreciate it. At least one day and night. If you have less time than that, you may not get enough from your visit to make it worthwhile. The weather is too hot in summer for all but the hardiest of souls, with daytime highs topping 120°F and surface temperatures nearly hot enough to literally fry an egg on the blacktop. The best months are December through February when days are mild. Wildflowers are most likely to be abundant in years when rainfall exceeds two inches, falling throughout the winter months. The bloom starts on the valley floor in mid-February and extends through May in higher elevations. Death Valley National Park is open year round and entrance fees apply. You won't find a manned kiosk on the road going in, but you can pay at the visitor centers and at self-service machines located at Badwater and other spots. If you have a National Parks Pass, stop by any ranger station to check in. The park uses 80% of the fees it collects for improvement projects, so don't short-change them. There's an extra fee for a guided tour of Scotty's Castle. During the annual National Parks Week, held in April entry fees are waived in more than 100 parks nationwide, including Death Valley National Park. Entrance is also free on selected other days that vary by year. With only a few major roads, Death Valley is easy to navigate. A good look at any map will show you how it's laid out. The Death Valley National Park website links to several good ones. Over-reliance on GPS or mapping websites can get you lost in Death Valley - occasionally with deadly consequences. Your best resource here is an old-fashioned, printed map instead. The Oasis at Death Valley Resort offers four places to eat, including a casual cafe, an old-fashioned steakhouse and the upscale restaurant at the Inn at Death Valley. You'll also find restaurants and mini-marts at Panamint Springs and Stovepipe Wells. You'll find only a few eateries, and they're far apart. Your best bet for lunches is to take something along with you. Rangers recommend drinking as much as a gallon of liquid per day, so super-size that drink cup and take lots of water wherever you go. Stovepipe Wells has the lowest gasoline prices in the park. In the sun, 75°F feels more like 85°F. Be prepared to feel hotter and get thirstier than you might expect. Death Valley's ups and downs can confuse hybrid vehicles' range estimates. The drive from Stovepipe Wells to Panamint Springs is 26 miles on the map, but the 5,000-foot climb through Towne Pass consumes gasoline so quickly that a range estimated at 106 miles when starting can dwindle to just 22 miles by the time you reach the Panamint Springs gas station. Get up early enough to see a sunrise. Set your alarm clock if you need to. A cooler filled with cold drinks will be a welcome traveling companion. Don't forget your camera. Binoculars are good to have, too. If you plan to have dinner at the Inn at Death Valley, the dress code is "desert casual" - shorts, tank tops, and t-shirts aren't allowed. Before you go there, be sure your vehicle is in good mechanical condition, with no tire problems and a full radiator. Many roadside restrooms in Death Valley lack running water. Bring hand sanitizer or wet wipes. Your cellular telephone may not work here. Don't depend on it. Photographers: With mountains soaring more than 11,000 feet on its west side, the valley falls into shadows starting up to an hour before sunset - and by the "official" time the sun goes down, it will be completely in shadows. Pets must be leashed at all times, and they are not allowed on any trails.